Unleash your inner competitive streak, and battle it out for First Place with Gala Bingo‘s Premier Prize Draw! If you win the championship title, you could enjoy Free Bingo and walk away with a share of £90,000! This is your moment shine and compete for your share of the £90K prize pot, while playing some of your favourite slots games! 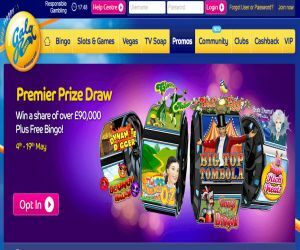 The promotion has already begun, but there's still plenty of time to catch up as Gala Bingo is shelling out up to £3,000 to prize winners every day until Thursday 19th May! To race into the winning action, all you have to do is opt in once and spend just £5 in cash on the featured daily games to enter the daily Premier Prize Draw. The £5 entry will also earn you a ticket to access the Pina Colada room to play Roll On Bingo games. The games will be hosted between 6pm-9pm each Monday throughout the promotion, and you can scoop up to £15,000 in bingo bonuses each week! Hurry! Head to Gala Bingo to compete for your winning place!